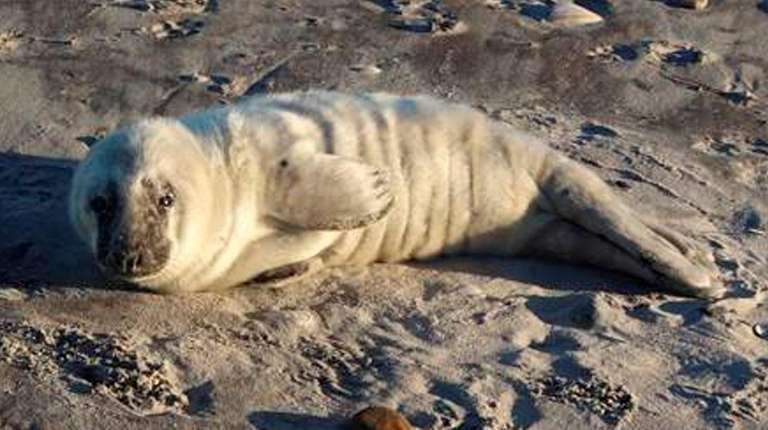 Awww, you just gotta say there’s nothing quite like a video of a doe-eyed baby seal, just sunning itself on a cold Hampton Bays beach, to get a little smooch from the Internet. Since being posted on Facebook Tuesday, the brief video of the gray seal pup, which was reported Sunday night by a walker on Ponquogue Beach, garnered some 2,000 views, close to 50 shares and more than 180 likes. The creature, a month or so old, “appears to be in good condition” and “exhibited appropriate behavior by moving and growling at the approach of a potential threat,” said the Facebook post from the Riverhead Foundation for Marine Research and Preservation, which had sent a biologist and others out to take a look on Monday. That’s why the creature was left to its own devices, said the foundation, with no sight of it Tuesday when a biologist went for a return visit. Should beach walkers come across this or any other such creature, they should know to stay at least 50 yards away — that’s 150 feet — as getting closer or interfering in any way is against federal law, the foundation said. Still, sighting reports would be most welcome at 631-369-9829. The public’s hotline input in “letting us know what’s going on” is highly valued, said Robert A. DiGiovanni Jr., the foundation’s senior biologist and executive director. “We just want to make sure they do it correctly,” by giving the creatures that wide berth. Gray seals, known to be gregarious with their own kind, can be seen on Long Island beaches especially from February through June, with December through February the main “pupping” season in areas of Massachusetts and Maine, the foundation’s spokeswoman said. Recent years have brought a handful of sightings of gray seals as small and young as the one spotted Sunday, DiGiovanni said. With no proof in hand, he said his team has been putting in extra effort to monitor the area’s gray seal “haul out” — aka, hangout — locations to see if there’s any solid evidence to indicate that pupping could be occurring locally. As for the youngster spotted Sunday, not to worry too much that it appeared to be out and about with no direct parental supervision, as these pups “nurse for 17 to 18 days, and then they are normally off on their own,” the foundation said in response to a question on Facebook. Still, DiGiovanni said, the only circumstances that his team can be sure of is that the baby seal was there, with no indication as to its family situation. Gray seal pups start out with white fur that quickly molts away, and can quadruple in size in their two to three weeks of nursing, according to the Woods Hole Oceanographic Institution website. That’s as mother’s milk can be as much as 50 percent fat. Within a week to a month following their weaning, the site says, the pups have been known to wander as far as 600 miles away.